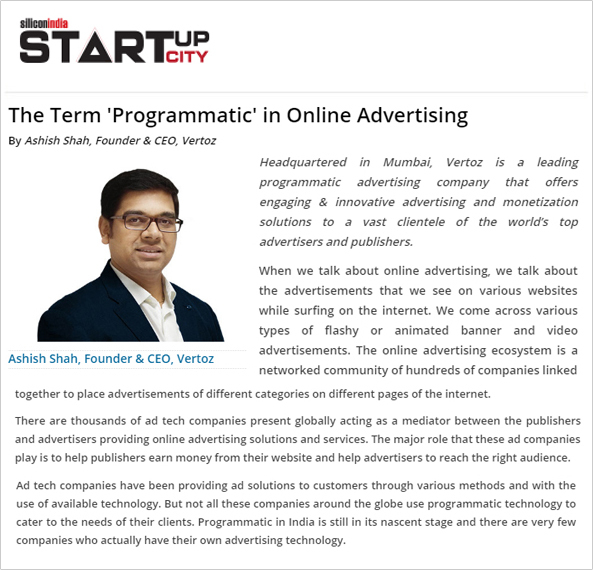 Our CEO, Ashish Shah imparts knowledge about programmatic and how it works which will definitely help us solve misconceptions related to the programmatic world. With over 462 million people using the internet today, India has become a massive market for advertisers to target its desired audience. The online advertising ecosystem is a networked community of hundreds of companies linked together. It is the pure amalgamation of advertisements of various categories on various pages of the internet. With programmatic advertising expected to account for more than 50 percent of digital ad sales by the year 2018, we believe that it is high time for the traditional advertisers to move to programmatic advertising and focus more on various methods of online advertising. Startupcity wants to help build smarter Startups in India and thus help build smarter India. They venture out for those entrepreneurs who want to share their dreams, about their startups and tell their story. MNC’s both in India and globally appreciate to read about upcoming companies so by using new and innovative solutions, they can get an edge in their own businesses. Vertoz is a leading programmatic company that offers engaging and innovative advertising and monetization solutions. As we all know programmatic advertising consists of automated media buying, placement, and optimization of digital advertising, where both supply and demand partners are free from human intervention. Our ingenious platform, proprietary technology and advanced capabilities empower a global roster of top advertisers and publishers all under one roof. We want to upgrade our technology to make it more user friendly and build strong partnerships with others. Vertoz is inspired with this revolutionary era and we wish to evolve more and witness 100 % growth.